CTC claims a Facebook driven-membership of 40,000 people. That’s a lot for an outdoor club. How do you keep them engaged? Do you have a busy calendar? Our activities have evolved nicely and naturally over the years. Nothing planned. Every year we get into five new activities. Open water swimming, triathlon, ultra-running in the hills – it all happened so. Initially, we were focussed only on the weekends because all of us work. We never thought of making time for weekday mornings. Now they get up at 5 AM, they run, they swim; they do so many activities during weekday mornings. In the earlier days, it was mostly hiking on weekends. About two to three years ago we realised that we had time; so we started planning all 52 weekends. There are biking trips, hiking trips, photography trips. We also started doing major events like big marathons where over 1,000 people participate, triathlons and cleaning up of Chennai’s coastline. It got very busy with a mix of major and minor events. That’s why two to three years ago I started thinking how can we do more and thus became active on weekday mornings too. Now from Monday to Friday we do many activities such as running, swimming, cycling and zero waste community work. We go to fishermen’s hamlets for cleaning up the place, educate people on segregating dry and wet waste. We have been successfully doing this for the last six months in fishing hamlets close to Marina Beach. There are tree plantation activities going on. So a lot of things are happening on a daily basis. This February marked nine years since Chennai Trekking Club started. Of the 40,000 members, how many are truly active? That’s of course an interesting thing. I am a bit of a known person here. Whenever we meet there is somebody or the other who tells me, “hey Peter I am one of your members.” My response is, “have you been to one of our events?” Nine out of ten people will say I have been a member for one year but I haven’t had a chance yet to attend. A lot of people become members seeing our pictures on Internet links and our Facebook page. I would say of the 40,000 members about 5,000-10,000 would be active. That is also a sizeable number. Of these, there are some people who probably come just once a month or for some weekend activity. When it comes to a physically active life, the popular excuse you hear is that there is no time for it. In a city like Mumbai many activities are held over the weekend. How do you take out time during weekdays? Today for instance, you all first ran, then swam and will shortly proceed to office. How do you find time for this on a day to day basis? Too many of us come up with excuses. All of us are working. Most of our active members are working in the IT corridor, which is within 30 minutes from where most of our activity is. If they start working at 9 AM then definitely they can do something till 8-8:30 AM. I don’t think office is the limitation. It is more like people getting into morning habits. It is a mental issue. The morning is so beautiful. If you sleep by 10 PM and get a good night’s rest, you can start early with some activity. Once you get used to it, it is very addictive. If you go to office after three hours of sports you feel so fresh, so focussed. This morning physical activity routine is so good. Everyone has time according to me. People think they don’t have time. Everyone has time. It’s just a question of discipline and motivation to get up early and start the day. CTC is now a multi-activity club. Did this profile of activity grow organically or were there people driving specific interests? Nothing was planned over the past nine years. It started with hiking. Then it was natural for a lot of photographers to join our group. So we had photography related trips. We took people to beautiful natural places. We were good at map reading; topographic map reading. So we were able to make our own trails. Because of my background in biking we also did a lot of biking trips. About 4-5 years ago we started getting imported bicycles in India. So we started mountain biking trips. More recently, running became quite a rage with the help of social media. Initially we did 10 km runs around the city. Now for the last two years I have also been actively involved in hill running. Once a month we go to a beautiful hilly place to do trail running. We have a lot of hills in Tamil Nadu. 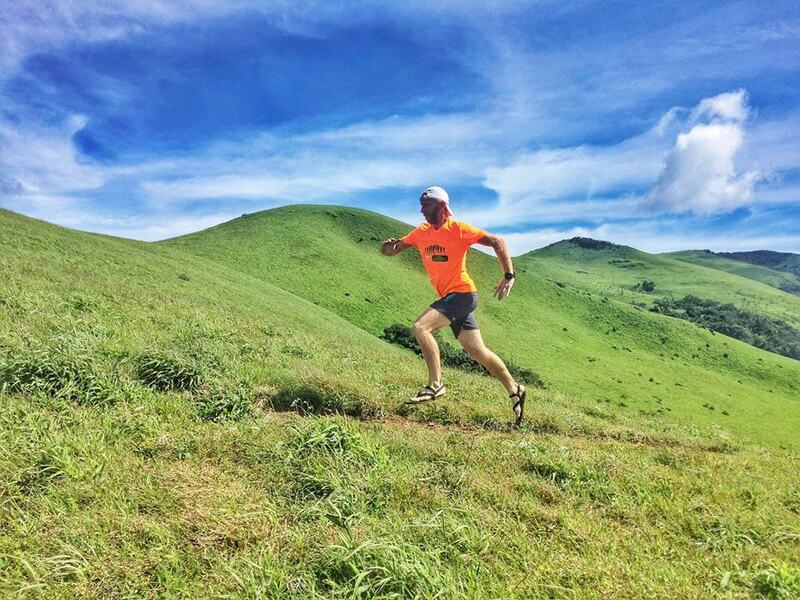 We do ultra-trail running; sometimes 50 km on Saturday, 50 km on Sunday. We run from morning till evening. It is not like a marathon where we run for four hours. All these activities have happened naturally. Once we started running we discovered this big quarry just 30 minutes away from our office and then we started swimming. We then started organising triathlons. Now people come from all over the country for these triathlons. We also saw a lot of natural places being spoilt by garbage and anti-social activities. 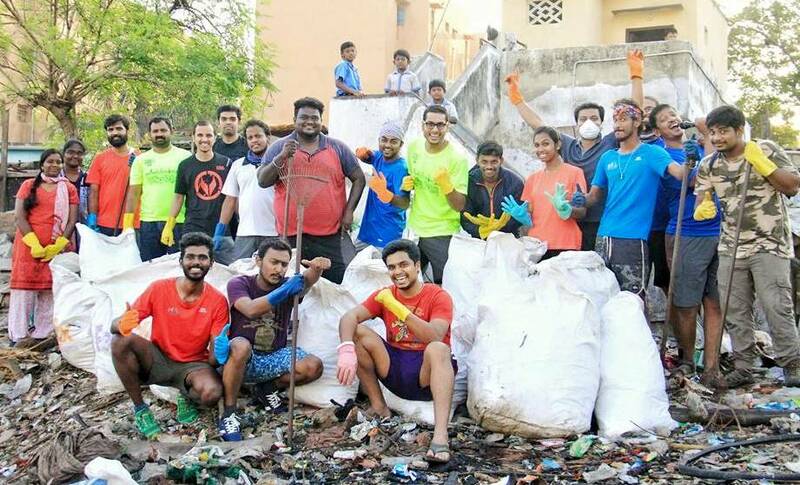 So we started clean-ups and created awareness automatically. Then we went to the next level of garbage segregation and zero-waste communities. We are working with corporates and with schools to create awareness about it. Every year some three to four new activities are being added to the list. How receptive are your members to these activities? We have a very well connected group. We have a mailing list of 30,000 people and a Facebook group of 40,000 people. We are pretty good in capturing whatever we do with social media, visual photography, smartphone etc. We post a couple of pictures and then it gets picked up. Thanks to digital photography we are able to capture beautiful pictures and upload them quickly. The only thing that we need to do is to keep the activities going consistently. Our organisation is pretty flat and open. But we do have a core group which plans and drives activities. .
Events like triathlons can be competitive. When you look at CTC, are you looking at it from the perspective of building a competitive group of people or making activity more participatory in nature? There are two elements here. One is inspiring more people to get into a healthy lifestyle. The other is competition. We are not that competitive. We do timed events so that people do the sporting events seriously maintaining the spirit of the event. That said, in the last few triathlons we did not have any rankings or places on the podium. We really want as many people as possible to get into swimming, cycling and running without it being too competitive. When I see people going for the top five or top three positions, I suspect they are losing out on passion as they are too obsessed with time and podium. For us it is not just sports. CTC’s mission is being close to nature such as beautiful jungles and mountain ranges. So we always combine sports with nature. We will not swim in swimming pools; we will not run on city roads. We always take people to natural places. If you spend one hour close to nature you feel so refreshed. You get so much from nature. All of us are born in nature. 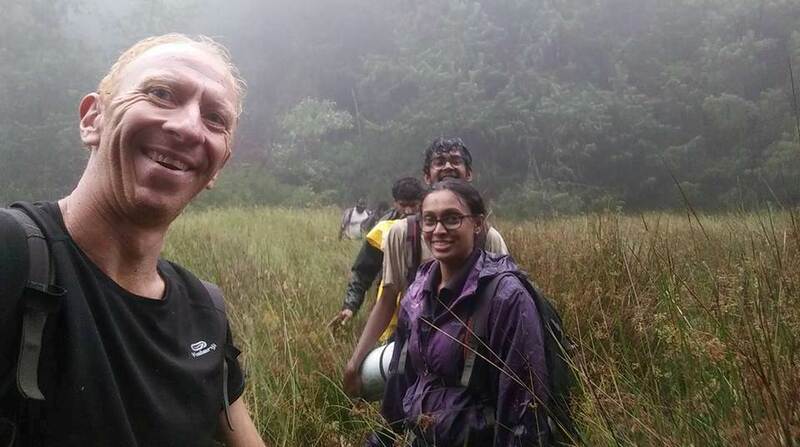 During the Republic Day weekend some 25 of us went to Meghamalai forests. For four days we ran and cycled through the tea estates and dense forests from morning till evening. The amount of positivity and freshness you get from doing this close to nature rather than doing 10 km loops in the city is something totally different. It is important for people to be close to nature because everybody in cities are so disconnected living in air-conditioned cubicles and enduring traffic, chaos and stress. They desperately need to reconnect with nature. The great outdoors has such a detoxifying and destressing impact on us. Most deaths in urban India are related to lifestyle problems. We want to move people into a healthy lifestyle. Nature is very important for physical and mental wellbeing. The Himalaya is often spoken about as the place to go to for outdoor activity. 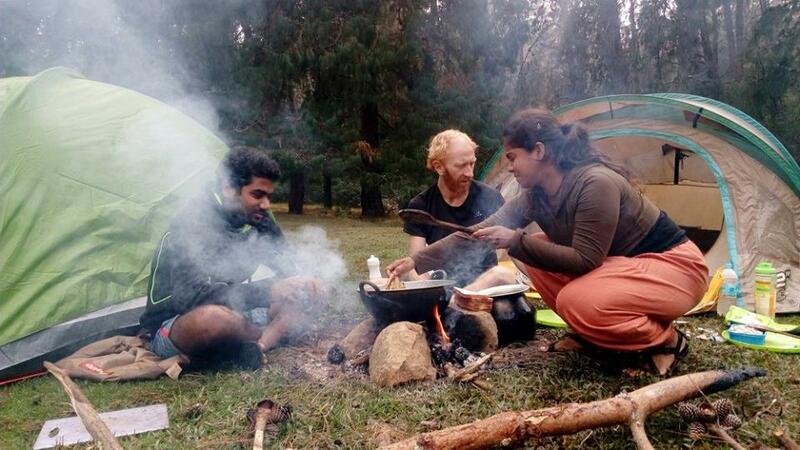 You have a great amount of experience in the outdoors of South India. What do you think about the options for outdoor activity in the south? The Himalaya has always made a big impression on people, including me. Last September I did a self-supported 500 km solo run through Zanskar valley and Ladakh. In 2015 also, I ran 1000 km with a small group of people; not just in the touristy places of Manali-Leh but in remote places like Spiti. We carry our own tent. The magnitude, the remoteness and the beauty of the Himalaya is fantastic. But here in the South also there are a lot of beautiful places. Many people say Bangalore and Pune are good. The Western Ghats are beautiful. Chennai is also blessed with beautiful mountain ranges. We have a couple of ranges like Nagalapuram, which is just two hours from the city. We also have a lake called Pulicat Lake. Lot of evaporation takes place, so clouds form, they rise and hit this range which is about 800 m high and then condense to form rain. Rains fall throughout the year in this place. Throughout the year there are pristine springs and because of that it is possible to go there throughout the year. Once you get inside the jungle, it is lush green forest. You have Kolli Hills and Javadhu Hills. We go to places in Kerala and Karnataka. There is the Kabini forest. In the four southern states there are so many options for hiking and other activities. Hiking in the south is nice because the weather is good. It is not too cold like the Himalaya. Also, the Himalaya attracts people for the snow and the peace. In portions, it is more like barren land, vegetation is bare. Here, on the contrary, we have beautiful jungles, lush forests; lot of water is present in these forests. 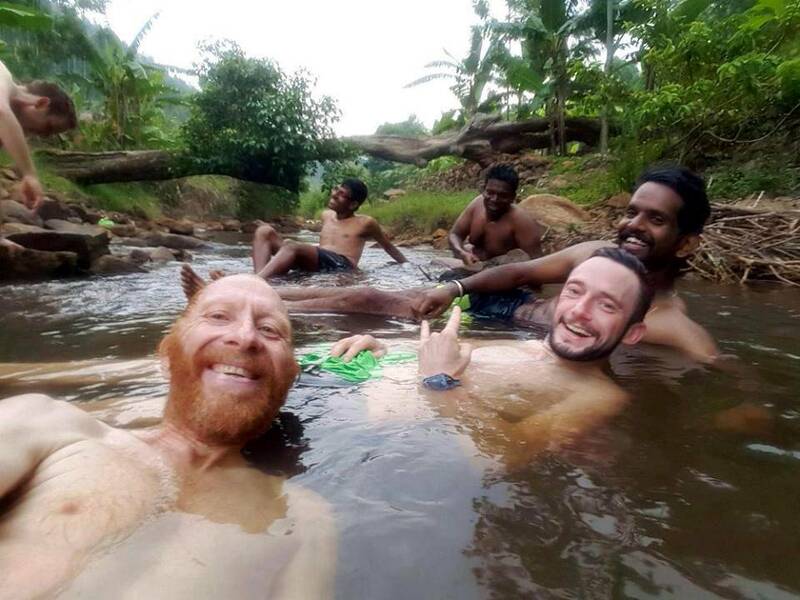 In the Himalaya you cannot take a dip, here you can swim easily. Here it is quite safe to trek, there you have to be very careful because weather conditions can be life threatening. Here you can trek light, you don’t have to carry much. I prefer hiking in the south. The peninsula is where the Indian subcontinent meets the sea. We are blessed with a long coastline, one that is longer than the mountains to the north. Do marine sports interest you? Once every two weeks we go for a long swim in the sea. I stay at Pallavakkam, just 200 m from the sea. So whenever I feel like it, I walk out of my home in swimming trunks, enter the sea and do a 2 km-swim. That’s again an amazing experience because of the vast openness. There’s nothing above you, nothing around you and all you can see is small houses along the coast line. It’s peaceful to swim in the sea. Eventually, we would like to organise triathlons in the sea. You have had accidents at CTC, including a couple of fatal ones. Many states have begun drawing up regulations for outdoor activities. Arguably, there is a problem in India when it comes to imagining regulations for the outdoors. Given that Indian lifestyle is predominantly sedentary, rules and regulations are often imagined by people partial to the convenience of settled life. Do you find this a problem? Do you feel that rules and regulations are not sufficiently empathetic to the pursuer of an active lifestyle? A couple of things on that: one thing that has been difficult for us is dealing with government agencies, whether it is forest department for permission to go on a hike or the sports department of the government. There is small time corruption. It is difficult for us to get permission to get swimming pools for triathlons. Similarly, it is very difficult to get permission from forest officials to get to do a hike. It is more like an administrative hassle and I am not even coming to the rules and regulations that might be there for adventure activity. It is the administrative hassle. Do you think there is sufficient appreciation for adventure activity? 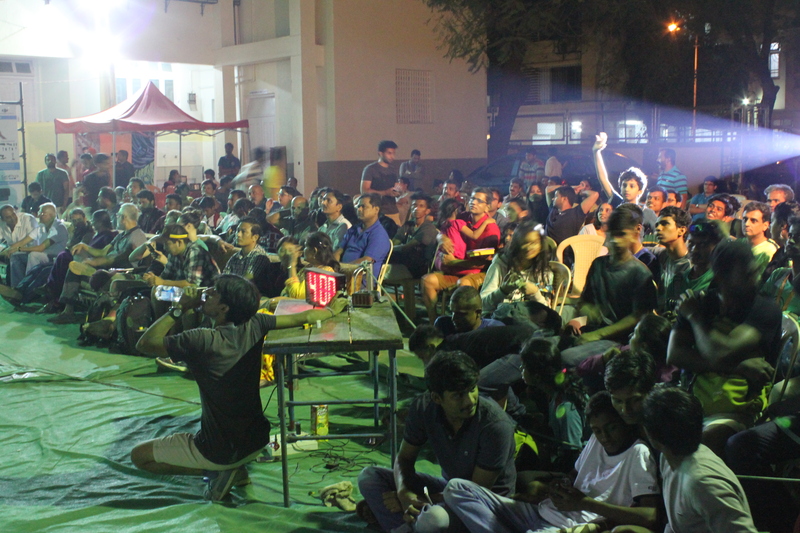 In Bangalore, there is an outdoor culture. Also, in the Himalaya there is a large community that is involved in the outdoors. But Chennai is very conservative. There is so much beauty around but people would go to the beach or visit Mahabalipuram. Or they would go for a movie and nothing else. Even now when we go hiking, many of the parents are wary as they think those going for hiking or trekking are just going to booze and do some anti-social activity. They don’t look at it as a positive activity. Many of the guys who come with us on a trek may not have informed their parents and that becomes a problem. If an injury or a fatality occurs we have to deal with hostile parents. It is not easy but things are changing. In the last three to four years outdoor activities have become popular mainly because of social media. If you look at Wipro Chennai Marathon, it has grown phenomenally in terms of participation. About four to five years ago very few people used to run the marathon but now it has grown to 20,000 in terms of participation which was unimaginable 3-4 years ago. Runners would post pictures of podium finishes and other related pictures and that would put peer pressure on others to join. Sometimes people are obsessed about doing something quickly without proper training. We are trying to get people on a regular basis into sports, make it part of daily life and not just see it as competitive events. I prefer regular ongoing activities rather than one marathon and one month to recover. In Europe and America people grow up with the outdoors as part of their life. There is nothing like outdoor experience being apart from one’s normal existence. In India, life is largely around human clusters and space indoors. The outdoors is distinctly ` outdoors.’ Do you find anything different in the way the average Indian relates to the outdoors? I see that youth here is so much focused on education and studies that there is absolutely no space left for other activities. I see very few parents encouraging their wards to get into other activities. These kids are always busy at school and occupied with studies. You only see them in the month of May when schools close for longer holidays. Outdoor activity has very less priority, I would say. That’s a problem. I got a lot of exposure to nature during my younger days. I started swimming quite early. I used to go hiking with my parents. Whatever you do at a young age makes a huge impact. Young minds are very perceptive. Doing something later becomes much more challenging. Chennai is pretty conservative compared to other cities. In school and college years, youngsters are busy with studies. Once out of college and into a job, particularly the IT sector; then, they join us. Some of them are very passionate and quite regular. Then after about two to three years they disappear completely. Once they get married they are off the radar. Not like in Europe where you see parents with two kids coming for adventure activities. Here, once you are married you are not supposed to do any of these activities. About 90 per cent of them would disappear into married lives. This is a problem for me. I need organizers to carry on activities. Some disappear as they get relocated to other parts of India. Once they get out of Chennai they lose the momentum. Also, they don’t have that energy. Some people are lost when they change jobs and then they get too busy. Some go abroad for further studies. These are some of the reasons, active people disappear completely. That’s very sad because whatever passion they had will have to be buried and whittled down. When it comes to outdoors there must be emphasis on environmental sensitivity. Your organization brings large volumes of people to the outdoors. How much do you emphasise environmental sensitivity? There were reports about organisations taking people to Himalaya in large groups of 50 or so. Himalaya is a very sensitive place. What we do here is we put a head count. On a hike, we won’t take more than 20-25 people. We are very strict on that because if you take more numbers there is the issue of safety and also the issue of environmental impact. It is a bit of a challenge. Almost every weekend we take people to some spot or the other. One thing we do – judiciously, depending on the place – is that we don’t follow specific trails. We go through the wilderness using maps and GPS like explorers making our own trails. That way we kind of spread out and don’t go on the same trail. We don’t want to leave a permanent trail. 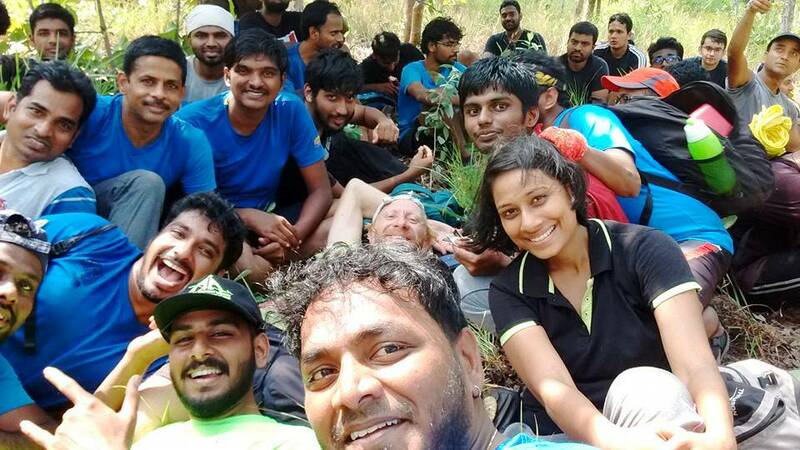 People have criticised Chennai Trekking Club because we were taking 300 people to some places. We have to strike a balance between bringing people close to nature and yet keeping nature largely undisturbed. We try and do activities in places which are not virgin nature. More than hiking we do a lot of trail running. Here again, we don’t go into deep jungles but mostly run on jeep trails between villages. Hiking is now pretty balanced. We never leave any garbage behind. We are very strict and disciplined about littering. We ourselves carry out environmental campaigns where we educate people about garbage. When people come with us they learn about the place and get very excited about the natural beauty. But some of them return with private groups and that’s when the problem of littering starts and things get nasty especially in places which are easily accessible. How do you ensure safety? Do you have safety clinics at CTC? Safety is very important and has many aspects to it. One very important aspect is to have the right organisers. All our organisers have grown as people. They have been coming with us for years and they are very responsible, very experienced. We often have two leaders on a trip, one in the front and one at the back of the group so that managing groups becomes easy and people don’t get lost. Number one killer is water. There are some people who get very excited seeing water and sometimes they jump in even though they do not know swimming. They assume someone will pull them out. We had a couple of cases in which people have drowned. Another problem is people straying away from the main group and then doing stuff which they are not supposed to do. Lack of adherence to safety is the number one killer in these outdoor activities. We are very strict about safety. We also make sure that our organisers and rescue team are excellent swimmers and are able to pull out people safely. We always ensure that non-swimmers carry tubes or life jackets with them when they enter water. In Himalaya, weather is the reason for calamities but here it is mostly water that causes fatalities. We do a lot of treks to places where there are beautiful streams and waterfalls around. We ensure that we keep an eye on people going into water. We do regular workshops in the group on first aid, basic CPR and we have an ERT group (emergency response team) who we can call anytime. When some people go missing, we call the ERT. They are very experienced and they come within a couple of hours. All these systems have naturally evolved over the years. When you dealt with serious accidents like fatal ones for instance, what did you personally feel? Did you feel that you were dealing with people who understood what you are doing or was it a case of adventure, outdoors – all those tags automatically branding you as guilty? Everything completely depends on the reaction of the parents. There are parents who say this was fate. And then we have had parents who went against us even though we had nothing to do with this. One time there was a youngster who jumped into the water wearing jeans. He is a good swimmer but all of a sudden something happens and he drowns. It all depends on the reaction of the parents. In many instances the victim of an accident in adventure / outdoor activity is an adult who consciously participated. Yet when things go wrong, that wilful participation by an adult is overlooked in the quest to fix blame. That’s definitely an issue. People in their 40s and 50s are still living with their parents and listening to their parents about what they should and should not do. I come from Belgium, which is not as forward as other countries. I come from a place where there are divorces and kids run away. I come from a place where the social fabric is disturbed. I concede that. But here people are too much under the control of their parents and too entangled in the social lives of relatives. I see many people who are extremely passionate about the outdoors facing tremendous pressure from their parents to get married, have children and then focus on the lives of children. It’s a vicious circle. Now there are situations wherein people don’t inform their parents about doing a trek because they are conservative. This becomes a problem. We, therefore, have a disclaimer that people joining in for our activities are doing so at their own risk. Ours is not a commercial organisation. We are all doing these activities because we are passionate about them and we do it in our free time. We all come together on an equal footing. About 20 or so people come together to do some activities. Of course, we ensure safety to the best of our ability. We have had serious difficulties with some parents, who were politically connected. We try to do a lot such as supporting the parents, helping in recovering the body, helping in transporting the body home and such stuff. There was once a case when one person from the group strayed off the path and went on his own trail. That gave us a lot of negative publicity. For the next four days we were looking for that guy. He went on his own journey. He never understood what trouble he caused us. The first thing we did was we informed the parents about their missing son and also gave them the location with latitude and longitude details. Police could have easily come there but police do not have the capability to come there. We went on a very active search inside a thick jungle. You did exemplary work during the time of the Chennai floods. What was the motivation for that? Our group is an open group. It is fully volunteer-driven. People come because they have a shared passion. Bangalore has so many groups but some of them have a commercial purpose. 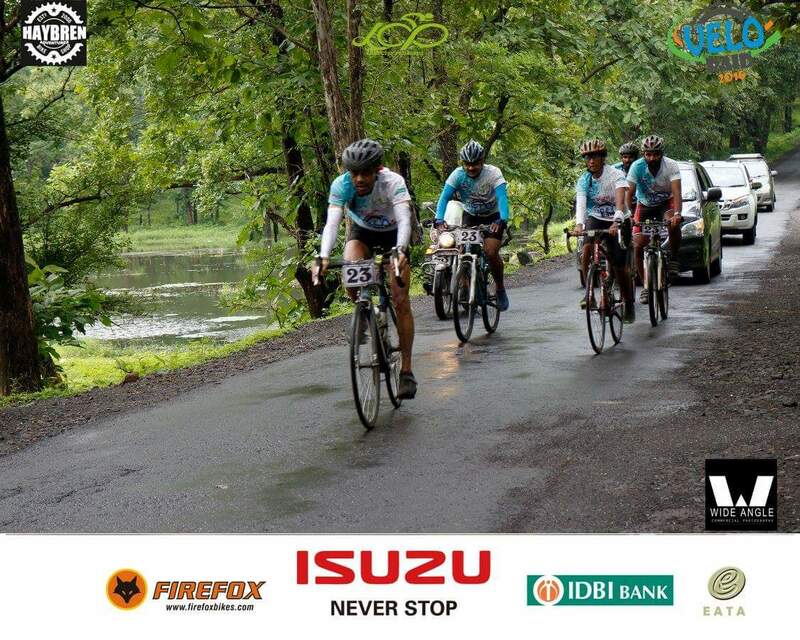 In contrast, we are a group of people driven by a shared passion who come together to run, swim, cycle and trek. So the energy and spirit is much more open. When something like a natural calamity happens, automatically people come together. During the floods, in a couple of days we had about 400 volunteers coming together and setting up relief centres. Social media helped in bringing everybody together but people came on their own. We started making kits that would help one family for two weeks. The coming together of people to help was akin to volunteering during an event. For instance, during a triathlon also volunteers are happy to organize the entire event. People spontaneously volunteer for events, they don’t sleep for two days, they prepare everything, set up the route, set up podiums and do all the preparatory work. We have been involved in clean-ups throughout the years. Perseverance is the key to keep the momentum up. And then it is backed up by social media. 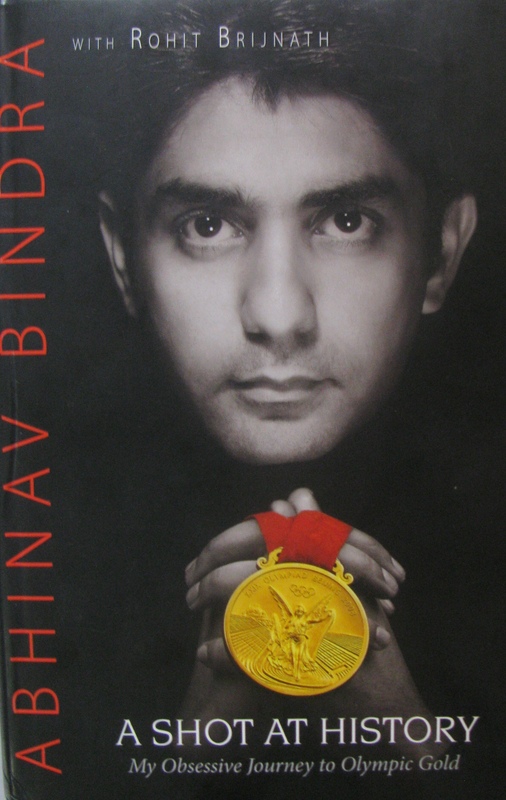 A Shot at History was published in 2011 roughly three years after Abhinav Bindra won gold at the 2008 Beijing Olympics. Bindra (with co-author Rohit Brijnath) writes honestly, starting with the puzzle most lay persons (including me) have – what is so riveting about a sport like shooting that entails no movement? Drawing you in with that question for bait, he shows you how difficult the quest to be still is and the extent to which an athlete aiming for an Olympic gold in shooting must go, to get that elusive perfectly still moment in which all works well and a coveted score is had without intent tripping the result. The burden of too deliberate an intent affecting outcome makes the moment of pulling the trigger seem a bit like quantum physics. But that is what it appears to be – in as much as there is a method to the madness of being perfect, being able to repeat it, shot after shot, competition after competition has an element of chance by universe. And yet with years of practice preceding a perfect shot would you call it chance? The book may be accused of overdoing its intense dissection of the art of shooting perfectly, but staying so it drives home the specter of Bindra’s sport being a contest separated by decimals in a field of already perfect scores. The book introduces the reader to the author’s love for the sport, details of the sport, the equipment used, the moments spent competing, the disciplined training, the competitors and coaches, the competitions ranging from those in India to the World Championships and Olympics – in short the world of competitive shooting. You can’t have a better guide for the journey than Bindra. The penultimate chapter, which tells how officials mess up sports in India, is a treat to read, coming as it does from the only Olympic gold medalist India has yet produced. If you haven’t read this book, read it. Lectures from mountaineering’s years gone by are like a breath of fresh air. 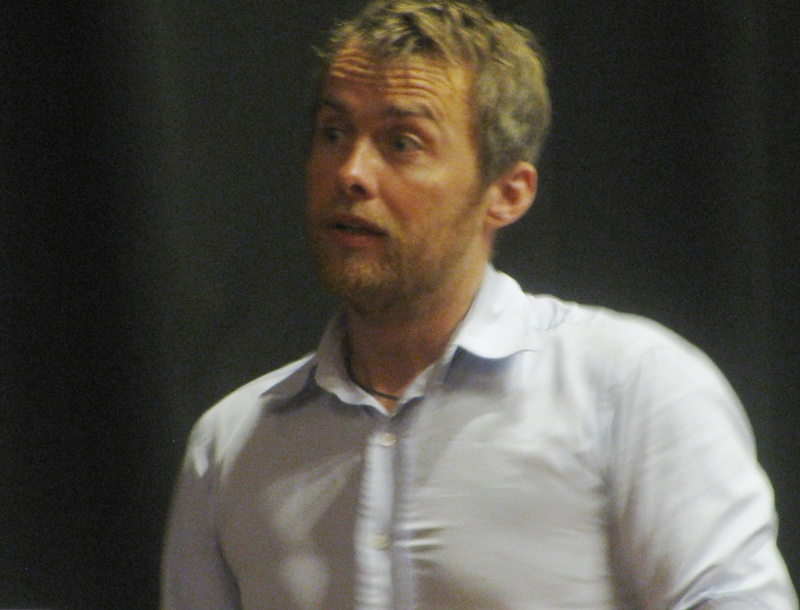 The other main speaker – here to deliver the Kaivan Mistry Memorial Lecture – was Leo Houlding. At 36, Leo was roughly 40 years junior to Doug, as much apart in age as the last hurrah of book shops from PowerPoint and world by Instagram. He was similar to the veteran in the essence of his pursuits yet dissimilar in tenor for in the decades that separate them, technology evolved sufficiently to leave nothing to the imagination. Both climbers have a penchant for big walls but while Doug became known as a mountaineer, Leo, despite an Everest ascent in the company of Conrad Anker, said he isn’t a great fan of snow, ice and altitude. 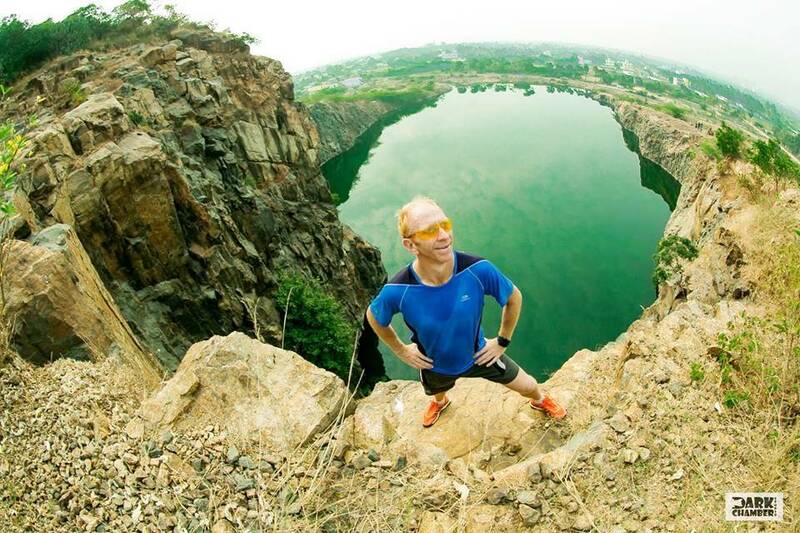 What attracts him is world stacked vertical; big rock faces – from Greenland to the Americas and Antarctica – that run uninterrupted for up to a mile vertically. The monasticism that graced the suffering of climbers from Doug’s period in climbing, you found in the technologically superb visuals of Leo’s climbs. What you once saw imprinted in the soul of man as the aftermath of a climb, you now see in the pixels of a camera sensor as it brings home to you what it was like to be out there. From the world’s still remote areas came visuals of vast snowfields with orange-brown rock thrusting up from them like teeth in a crocodile’s jaw. “ Those fangs – that’s what I like to climb,’’ Leo said. Intended or otherwise, Doug and Leo were an engaging mix at the club’s annual function for the transition by 40 years, they represented in climbing. In 1975 Doug and Dougal Haston had essayed the first successful ascent of the south west face of Everest. The climb included a bivouac on the south summit at 8760 m (28,908 ft). The much climbed peak is still trampled by many adding it to their bag of conquests, by the tamer, well used south east-ridge route. In climbing season, this route features a line of people making their way up Everest. Speaking of the predicament on Everest and other mountains, Doug said, “ if only you go around the corner, there will be nobody there. There is plenty of scope to commune with the mountain; just that nobody goes there.’’ In his life, one trip to the mountains led to another, all the way to Everest and beyond. “ Beyond?’’ he asked, adding in praise of alpine style climbing, “ Yes, I discovered that less is more. Less people, less equipment, less cost; it’s just you, your friend and a rope in between. Alpine style is simply wonderful.’’ He said that the problem with large, siege type expeditions “ is that only two people make it to the summit and everybody else is left wondering what it may have been for them.’’ Doug wrapped up his presentations with a slide show backed-account of his descent from Baintha Brakk aka The Ogre (23,901 ft) in Pakistan, an epic multi-day crawl of a descent given he broke both his ankles during an abseil. Accident notwithstanding, that trip in 1977 produced the first ascent of the peak. Thanks to Leo, the audience were treated to a film in the wake of George Mallory’s body discovered on the slopes of Everest, in which Conrad Anker and Leo follow in the footsteps of Mallory and Andrew Irvine. It showed a very rare instance of the Second Step (a rock face below the summit) being free climbed to test whether Mallory and Irvine could have reached the summit with what climbing techniques they possessed, long before a ladder came to be stationed there. Leo’s own take on whether the British duo may have reached the summit before Edmund Hillary and Tenzing Norgay: possible but not probable. The annual seminar also featured a film by a team from the Himalayan Club about an expedition in Ladakh and a presentation by Nungshi and Tashi Malik, famous for being twin sisters climbing some of the world’s well known mountains. It wasn’t difficult locating Venugopalan Arunachalam in the park. True, Tower Park in Chennai’s Anna Nagar had many people by evening. But there was only one person in distinct running shoes, track pants and a bright colored T-shirt that said: Chennai Runners. No need for smartphone and quick reference of Facebook photo; your senses said he had to be the quiet person, sitting at one end of a park bench. That’s another attribute, if one may submit, of those who have journeyed long in endurance sports – they typically have an air of self-contained detachment. Over the next two hours, we were treated to a conversation that every company in the country – public and private – should perhaps take note of. A septuagenarian now, Venugopalan was born almost 600km away in the port town of Thoothukudi (Tuticorin). He was the third child among six siblings. His father worked in the Post & Telegraph Department. That meant several transfers on work within the country. Venugopalan started school in Jodhpur but soon enough, the family shifted to Kalyan near Mumbai. There, he studied up to third standard before moving south to Thoothukudi, where he stayed with his maternal grandmother and studied up to class six. “ It was there in school that I won my first race in running. I was probably ten years old and a got a red soap box as prize,’’ he said. While Venugopalan was in Thoothukudi, his father had continued at his work in Kalyan. With his father being transferred next to Jabalpur, Venugopalan followed, struggling in the process with the shift from Tamil medium of education to English medium. At school in Jabalpur, he found himself qualifying in the heats for the 100m, 200m and 400m races. He practised daily for the finals. “ In the finals I came last in all three. The competition was really good,’’ he said. However that outing was both beginning of life as runner and a precious lesson learnt – maybe his strength wasn’t racing fast but racing long? In those days, the “ mile-race’’ was a popular fascination. For the following year, Venugopalan thought of registering for the 800m and 1500m events. He was a small, lean lad. In his tenth, eleventh and twelfth standards, the rather reserved and independent thinking youngster from Thoothukudi trained regularly for the distances he aspired for (he used to run five kilometers everyday) and consistently managed podium finishes in the 400m, 800m and 1500m disciplines. He also merited a second place finish in a 3.5 mile-race. “ It convinced me, I am better at long distance running,’’ he said. He practised his running mostly at night. His family was supportive. “ They didn’t know how much I was running but they were happy to see the certificates come home,’’ he said. Following his school years, Venugpolan opted to study mechanical engineering. While his father shifted to Delhi on work, Venugopalan moved to the Benares Hindu University (BHU). There, after other students had completed their daily dose of football, he would run on the ground, savoring the everyday fix of five kilometers he had got used to from school. On BHU’s annual Sports Day, he would participate in the 800m, 1500m and 5000m competitions, usually winning all three. “ Engineering students are typically a studious lot. 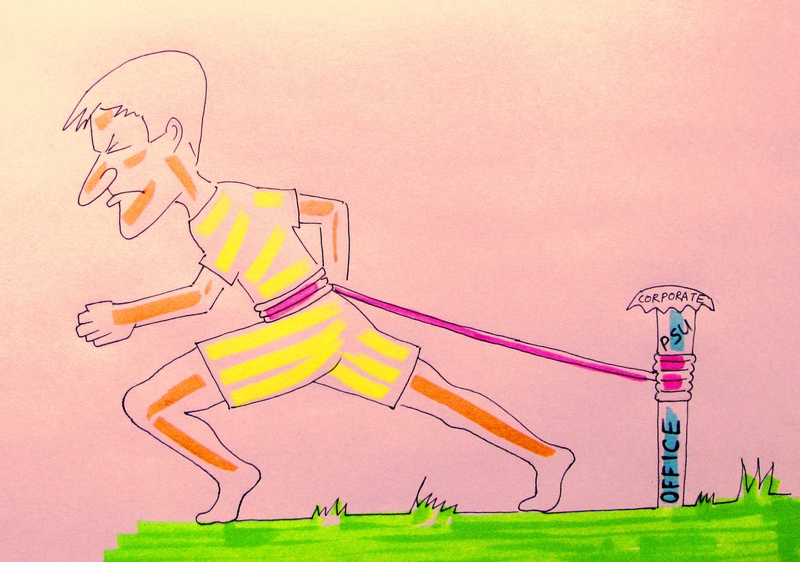 Work load is high and they don’t have much time for sports. The competition I faced in these races was mostly from arts and science students,’’ he said. Venugopalan passed out from BHU in 1968. He secured a job at Bharat Heavy Electricals Limited (BHEL) in Trichy. The company – a public sector undertaking (PSU) – was one of the leading industrial enterprises of the government. It was Venugopalan’s first job after BHU. For the next 40 years or so, until his retirement over a decade ago, aged 60, he remained at BHEL. Joining the company was a turning point. Life changed drastically for the young man used to running five kilometers every day and enjoying races, since school. At Trichy, BHEL had its own cocooned ecosystem. Its township was a good 14 kilometers away from town. There was running and sports in Trichy. But its vibes rarely reached the insulated township. “ The problem I faced was this. Both the Indian Railways and the military encourage athletics as part of sport. PSUs, in contrast, were partial to games. They had no interest in comparatively solitary pursuits like athletics,’’ Venugopalan said. By nature, he had little interest in games. Result – at BHEL, his active life came to an utter standstill and his fitness nosedived. At Anna Nagar’s Tower Park, the septuagenarian Venugopalan cut a trim figure. Back in his BHEL days, despite no smoking and drinking, by the time he hit his mid-thirties, he had sprouted a tummy. Around that age, all BHEL employees had to go in for a mandatory medical check-up. In the check-up, he was found to be mildly diabetic. It rang alarm bells for there is a history of diabetes in his family. Venugopalan speaks rather bitterly about this turn of events. 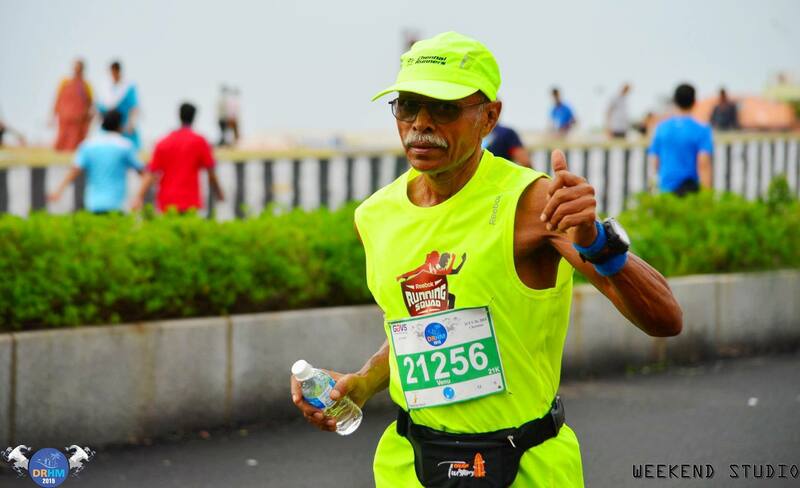 Although he resorted to walking to stay fit following the medical diagnosis of diabetes, up until his eventual retirement and exit from BHEL, there was no relapse to running. He says it was simply impossible in the ambiance of the township. For instance, the athlete in him was soon looking for ways to make walking more engaging. He read up on race-walking and began practising it. Needless to say, that made him an oddity. By the time people hit that midlife medical test, many would be advised to walk. But few – likely none – race-walked as they do at the Olympics. One man doing something different stands out in crowd of conformists. Is that why the industrial environment is partial to games? Games teach you to collaborate and conform as a team, while athletics is often a solo trip to self-discovery? One wonders. “ I firmly believe athletics should be encouraged at PSUs. On the one hand we say that it is not machines but manpower that is the wealth of an organization. But then, we make no provision for the health and wellbeing of this manpower. In their own interest, corporates must make arrangements for their people to have an active life. Running is the least infrastructure-intensive of sports. You can even do it alone. Nowadays, the private sector has begun recognizing this but PSUs in India still lag,’’ Venugopalan said. It wasn’t BHEL alone that appears to have weaned athlete away from his regimen. Along the way, Venugopalan got married and raised two sons. In the Indian context – as both culture and economics – family is a commitment and society’s perspective of this institution rarely accommodates what the individual desires personally for meaning and fulfilment in life. When Venugopalan shifted from mere walking to race-walking what catalyzed that move in man tucked away in industrial-township was the growth of the Internet. The worldwide web brought the notion of larger planet home; suddenly it was possible to leap over immediate society and notice others like you elsewhere. 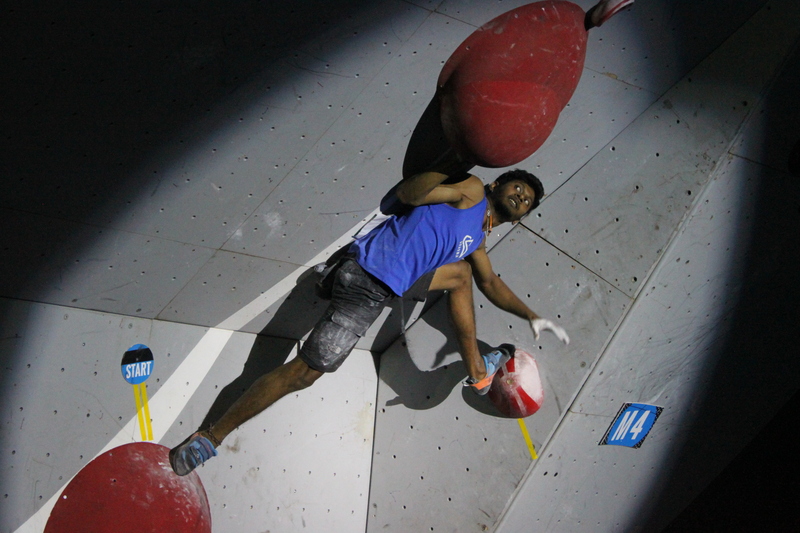 “ I read up on race-walking and started to practise it,’’ Venugopalan said. Used to having an early dinner, he was the type who experienced wakeful hours by 3 AM. So he started to go out for race-walking that early, come back and sleep again. Slowly, a commitment and devotion to something he was passionate about, built up. In 2005, Venugopalan retired and moved to Chennai where he stayed on rent in Anna Nagar West Extension while his house was being built in Anna Nagar West. Given he had elected to tackle his diabetes through exercise he continued the daily walking he had started at age 35. One day when out walking, he saw a marathon underway and elite African athletes go by. “ It ignites a spark in you. Such images, you don’t forget at all,’’ he said. Long forgotten running legs stirred restless again. As luck would have it, in ` The Hindu’ newspaper, he read about the group – Chennai Runners. He joined their Google group, regularly perusing their posts on running, occasionally pitching in with a comment. 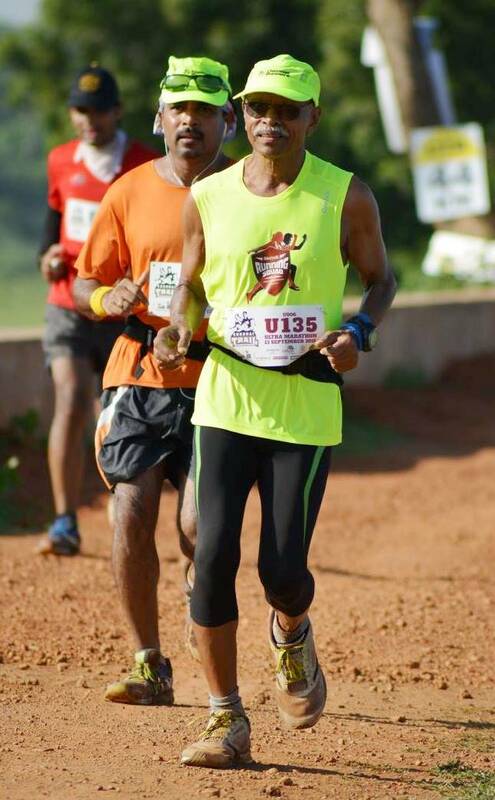 Meanwhile, his friend and running partner from BHU days – Brigadier K. Venkatraman – called up from Bengaluru informing that he had been running the marathon. “ That is how the seed to resume distance running was sown in my head,’’ Venugopalan said. His first attempts at running in the local park were a total failure; he would be out of breath in no time. So he started to jog around in his apartment, emerging to run in public only after he felt ready for the transition. He chose a 10.5km-loop in Anna Nagar for his daily run, covering it on the average in about 70 minutes. 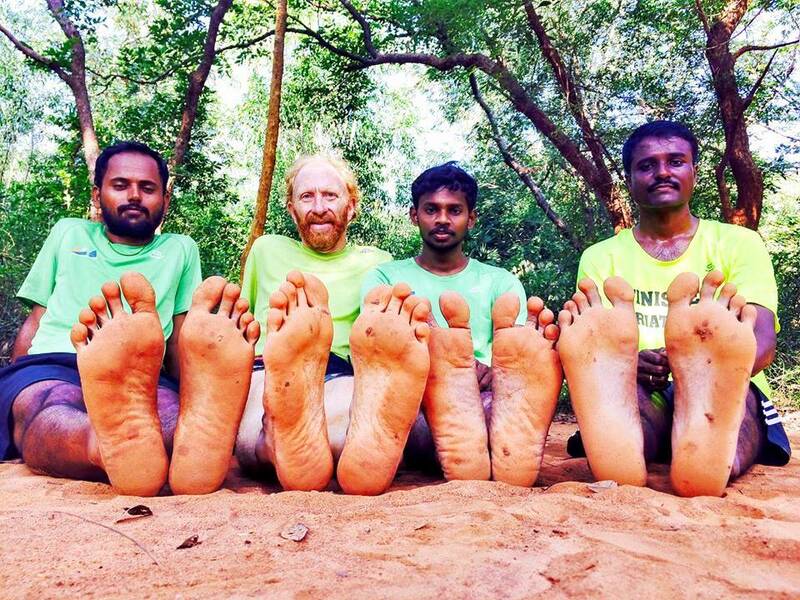 He ran 10km every day, raising the distance to 15km on weekends. Soon enough, he reached that point where he could run 10km without a break. Then the inevitable happened: one day he did two laps of the circuit, making it a half marathon. That was the first time, he had done 21km. “ It was a really good feeling,’’ he said. The East Coast Run in Chennai featured distances of 10km, 20km and 30km. In 2009, he did the 30km segment, completing it in a mix of running and walking. 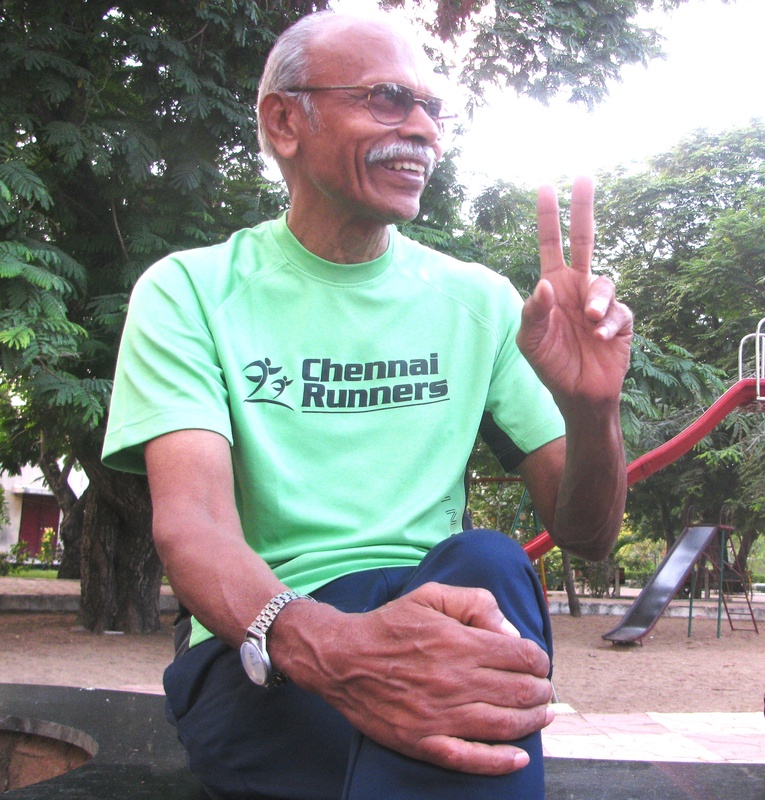 “ There I got recognition from Chennai Runners that at close to 64 years of age, I was able to cover 30km on foot. The way they used to talk and chat about it; that gave me self-confidence. It really helped me. People came to me, they spoke to me, they became friendly,’’ he said. 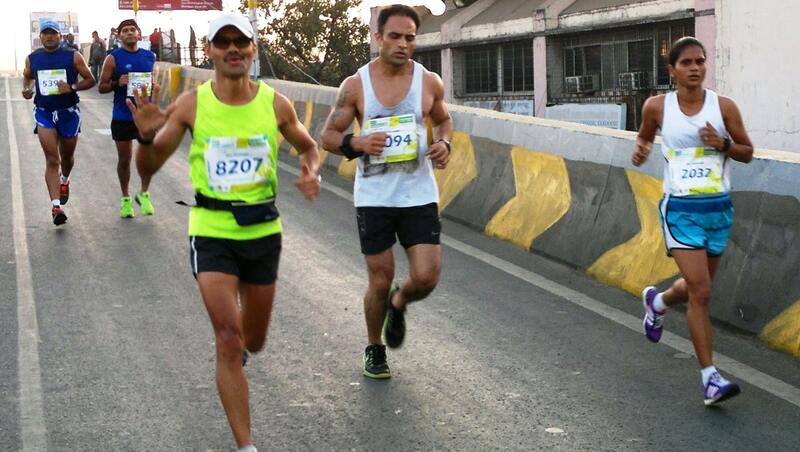 The sight of elite athletes in action, which sparked the resumption of running, had been from the Chennai Marathon. A year after that sighting, Venugopalan did the half marathon segment of the event, completing it in 2:20. “ Towards the end, I was quite tired,’’ he said. Then a smaller version of the BHEL-quarantine struck. Like most Indian parents, Venugopalan and his wife wanted to see their sons married and settled in life. The sons though – the elder one in particular – had a mind of their own. Over time, Venugopalan’s wife, initially skeptical of her husband’s running, had both become empathetic towards it and even commenced her own share of walking. However as prospective alliances for their sons fell by the wayside, she decreed that Venugopalan’s running should be halted till the required marriages occurred in the family. Two years went by so. During that period spanning 2010-2012, his friends in running would call up to inform of upcoming events, even offer to get him out of the house and running. He declined the offers, determined to address family responsibilities. At best, he went along to see his friends run. “ That’s hell, to see others run and not be able to run myself. My children are now married. Thank God the embargo on running did not extend to my children having children too,’’ he said laughing in jest about the many eccentricities of the Indian predicament. 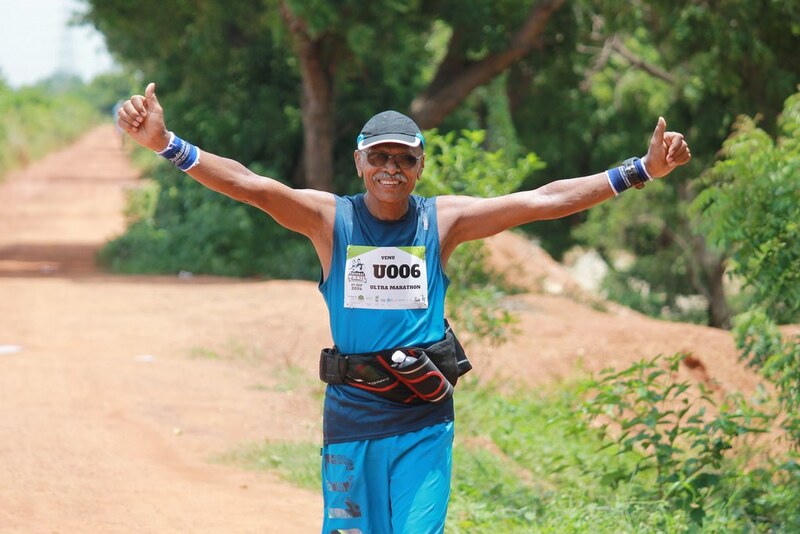 In 2013, Venugopalan ran his first full marathon at Auroville in Pondicherry, covering the distance in 4:55. 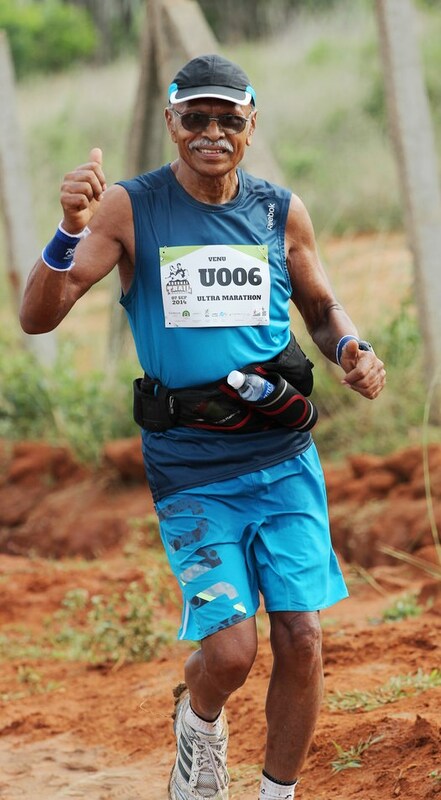 Later in the same year, he participated in the Wipro Chennai Marathon. He completed the full marathon there in 4:05. He has since gone on to get podium finishes at the Standard Chartered Mumbai Marathon (SCMM), finishing third in his age category in the full marathon in 2014, first in 2015 and third again in 2016. His personal best in the full marathon is 4:04. Aside from walking at aid stations along the way, at full marathons, he runs the rest of the distance. In between, he also did a race involving six hours of cycling and six hours of running. However, the gains have not been without their share of related problems. He has had to cope with running injuries. But what has laid him low is herpes. Its onset has meant a weakening of muscles. It forced him off the 2017 SCMM; he didn’t participate. Ageing athlete hasn’t given up. He has embraced the Pose Method of running, wherein gravity is roped in as active partner to aid one’s running. “ Using this method I am now able to cover 20km in 2:18. I must now add speed. I haven’t run a race yet using the Pose Method. Now I have to,’’ Venugopalan said. The evening light was now slowly fading and as the sun threatened to drop out of sight, the urgency of those playing games in Tower Park grew. A misdirected smash from a volleyball match racing against sunset saw the ball land close by. “ Careful, careful,’’ Venugopalan gently told the youngster who came to pick it up. He has often thought of what made him run years ago. He didn’t have a single answer. In his childhood he has chased after his older brother as the latter and his friends ran around pushing their toys – was that how it all started? He doesn’t know. “ I don’t quite know why running interests me. I think I like the feeling of the wind blowing in my face. It used to give me a lot of happiness. It is also true that when I run, I feel my body and mind is one and not limited. It is expanding. I feel I am one with the universe,’’ he said. 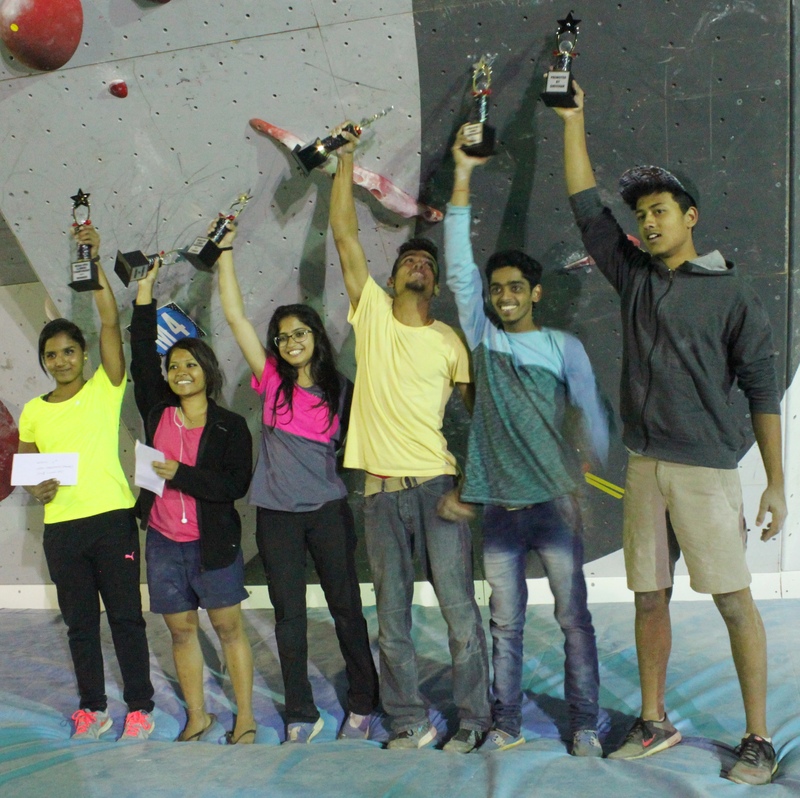 The competition was organized by Girivihar, the city’s oldest mountaineering club, which in 2016, had anchored the Indian debut of the IFSC World Cup in Bouldering at Navi Mumbai. 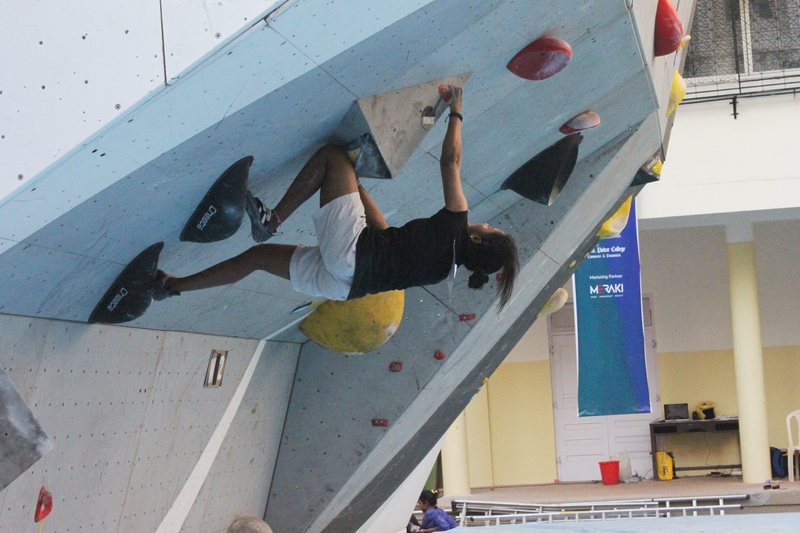 Podar College has a bouldering wall of modest dimension, managed by Girivihar. 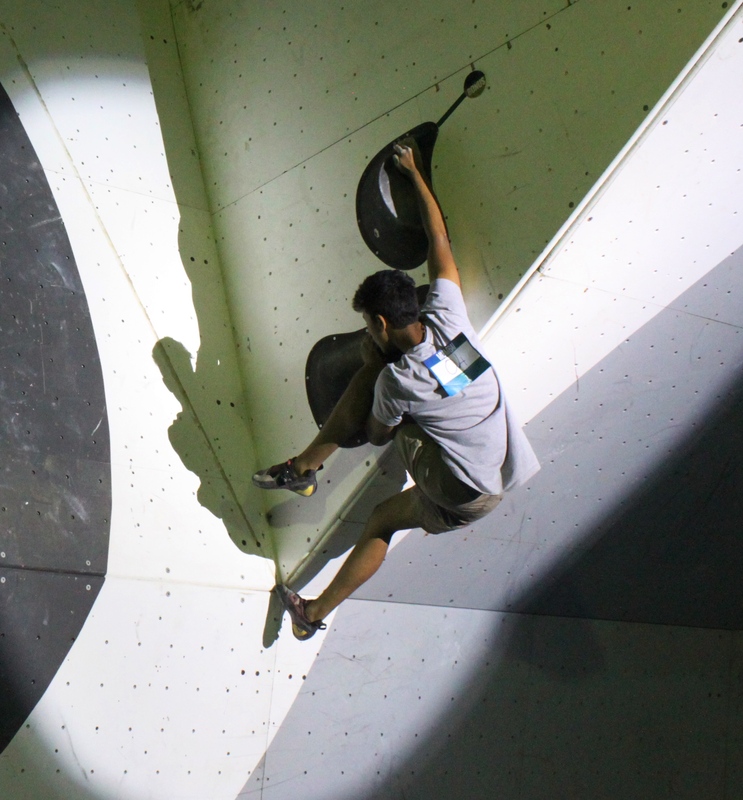 For the open climbing competition, Girivihar set up at the venue the wall it had imported for the 2016 World Cup. Compared to previous editions of Girivihar’s annual competition, turn out for the 2017 open was not high. 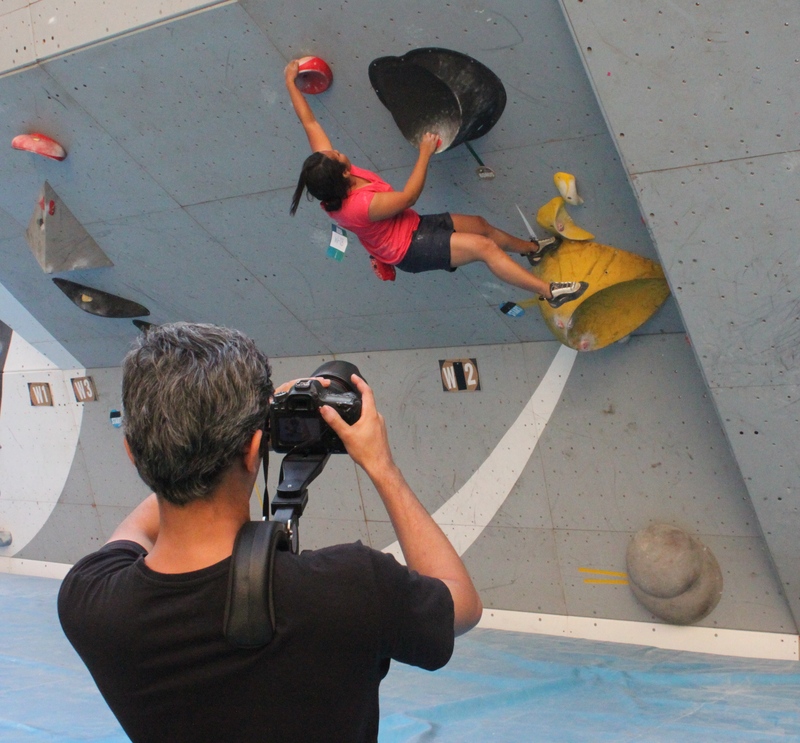 However the current crop of leading sport climbers in the country was well represented. 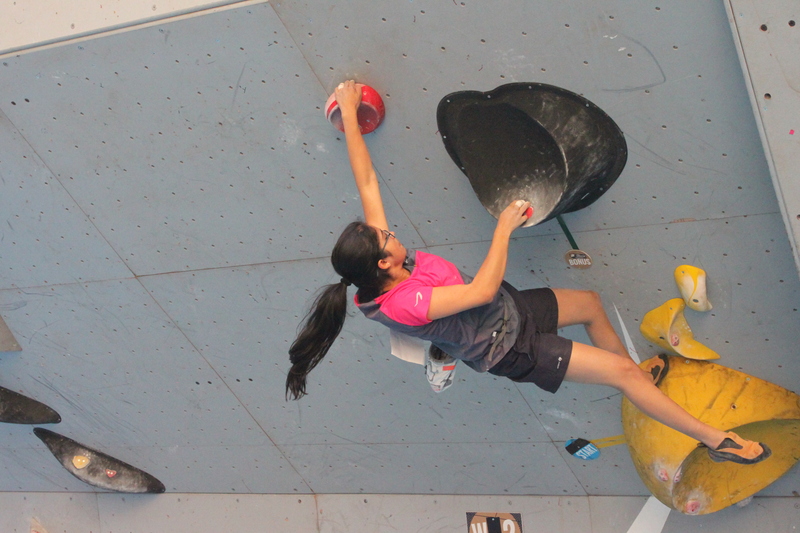 Adarsh Singh (Delhi) and Siddhi Manerikar (Mumbai) topped the results in the men’s and women’s categories respectively. “ Swimming is my passion. 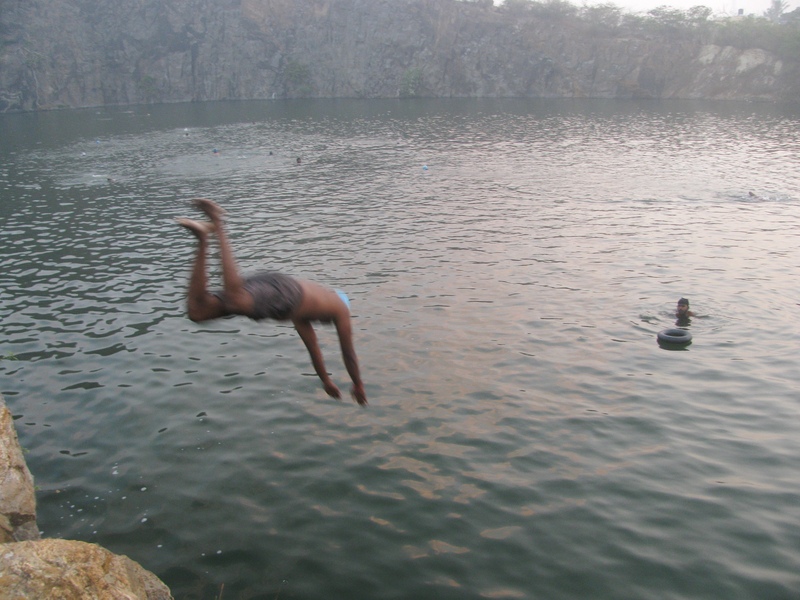 I am happiest in the pool,’’ Pravin Gaikwad, 55, said. The doctor though is best known as a runner; he is also a triathlete. His parents hail from Devgad in Maharashtra (the same Devgad that is famous for its strain of Alphonso mango). Pravin is the youngest of six children. He was born and brought up in Mumbai. His father worked at Ciba Geigy. His mother was a housewife. The family originally lived in Chembur; then shifted to Ghatkopar. Ghatkopar had a swimming pool and Pravin – then a sixth standard student – began frequenting it. The youngster went as part of group of dozen boys or so but in due course, most others dropped out. Pravin continued. Those days, swimming pools used to have their own swimming team. When he was in the ninth standard, Pravin was taken into the pool’s team. Training became systematic. In competitions that followed with teams from other swimming pools, he won a prize in the 25 m-butterfly stroke. By the time he was pursuing studies at the tenth and twelfth standard levels, Pravin was winning medals regularly at swimming competitions. At medical college which followed, he became captain of the college swimming team. However when he completed his MBBS and enlisted to do his MD, swimming had to take a back seat for work load was high. After completing his MD, in 1988, he joined Sterling Hospital in Vashi, Navi Mumbai and moved that side. By now Pravin was married to Arati, a fellow doctor who, incidentally, had also been his student. When the Gaikwads arrived in Vashi, it was the early phase of Navi Mumbai’s growth. Vashi and other suburbs in the region were hardly the well-developed residential areas they are today. For a pool to swim in, they had to go all the way to Belapur, where the local YMCA maintained one. For eight years, Pravin worked at two hospitals in Navi Mumbai. Then in 1996, the pediatrician started his own clinic in Nerul. The Gaikwads moved to Nerul, staying first at an apartment near the local railway station, eventually moving to a proper house in the center of the fast growing township. Meanwhile the commitment to swimming continued. One of the housing societies in Nerul, Sailesh Towers, has a swimming pool. The Gaikwads headed there first. For a brief while in between they shifted to the swimming pool at the D. Y. Patil sports complex nearby; then they returned to the pool at Sailesh Towers. In 2007, Pravin resumed participating in swimming competitions (short distance ones) earning podium finishes for nearly three years. Sometime in 1998, the Nerul Gymkhana started to organize annual cycle races. The Gaikwads were regular podium finishers in their respective categories with one year being particularly notable for the podium finishers included not only Pravin and Arati but also their children and Arati’s father. “ It was indeed a proud moment for the family,’’ Pravin said. In 2010, Arati’s brother Atul, asked her to participate in an adventure sports race in Pune called Enduro. It was a mix of cycling and hiking. 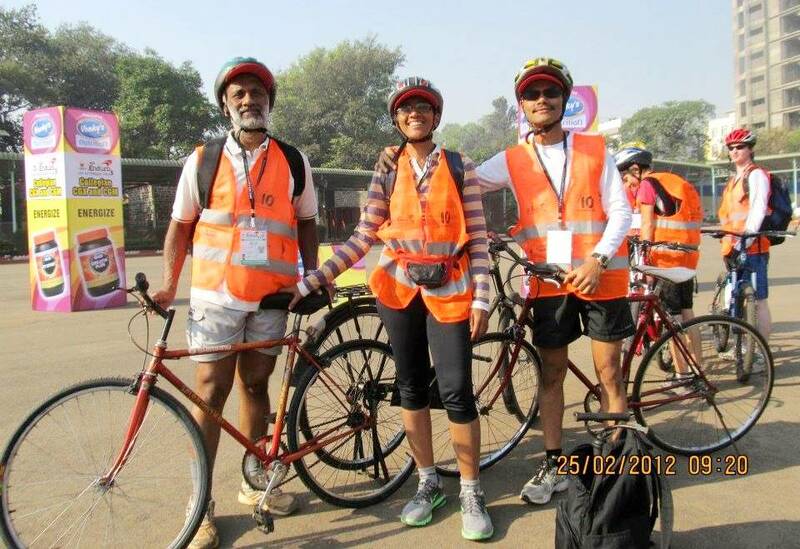 Pravin, Arati and Atul registered as a team in the forty plus age category; their team aptly named Fortified. They were podium finishers at the event in all the years of participation, in 2011, 2012 and 2013 as well. Like Mumbai earlier, Navi Mumbai too is an area blessed with enough nature to make a sports enthusiast happy, yet steadily losing that bounty to the incessant march of townships, roads and traffic. Vashi, Nerul, Belapur – they are all accessed after a sea crossing from the Mumbai side. Once you cross so, you see looming in the neighborhood, like a long wall, the stretch of Parsik Hill running north-south from Mumbra towards Belapur and Kharghar. Simply put, Navi Mumbai has quick access to both the sea and the hills. Not many places are privileged so. On the edge of Belapur, overlooking Kharghar is a wonderfully located road. It snakes its way up from near the Mumbai-Pune highway to villages at the top of the seasonal Pandavkada waterfall. An early morning visit to this ascending road – some five kilometers long one way – would yield a collection of runners, walkers and cyclists. There are other such roads frequented by walkers and runners in Navi Mumbai but this is the prince of it all. Locally, it is called Kharghar Hill Road. In 2011, the Gaikwads were out walking on this road when they met two runners – Surya Buddhavarapu and his wife Sudha, both of them, members of the group: Navi Mumbai Runners (NMR) – who suggested that they get into running. Until then, the Gaikwads had done the occasional run. They hadn’t ` taken up’ running. We use the term ` take up’ deliberately for Pravin is by nature and grooming, a diligent pursuer of what he decides to do. He believes in systematic approach and committed preparation. “ At school, I wasn’t very intelligent or anything so. I was hard working. Studying medicine may have strengthened further the need to work hard and my faith in that approach. I have also read somewhere that if you keep on doing something, then you will be amazed by what you achieve,’’ Pravin said. He speaks with care; there is little impulsiveness and much that seems to hark of thinking through his responses. Arati in contrast, is a spontaneous person. She likes fun. Born in Maharashtra’s Dhule’s district and living since the age of two in Mumbai, she readily concedes that her approach to life is very different from that of her husband. She prepares and trains but not as devotedly as Pravin. And she isn’t above taking her chances at races, prepared or not, settling often for the satisfaction of completing a race as opposed to chasing a personal best timing or being on some trajectory of improvement. An element of fun is eminently acceptable. “ I have always been interested in nutrition and fitness,’’ she said. Shortly after the couple moved to Nerul, she bought a bicycle. “ The attitude was that you should be active, both of us were regular walkers’’ she said. At the time she bought the cycle, Nerul was a quiet place with only a bus stop where long distance buses halted, for link to Mumbai. “ We shifted to our current residence 10 years ago. The cycle travelled everywhere with us,’’ she said. In April 2011, Pravin reported for a NMR organized-run on the Kharghar Hill Road. He ran up and down the hill comfortably; he didn’t pause anywhere to drink water. Arati joined in at the next such run, sometime in May. According to the Gaikwads, NMR helped nurture and bring out their potential. Swimmers, they also noticed the difference in running. “ Running provides social context,’’ Pravin said. That was remarkably different from the secluded cocoon of immediate world that is the predicament of swimmer in water. What running provided was relevant for the Gaikwads. Besides, as Pravin pointed out, by then Arati was also running well. 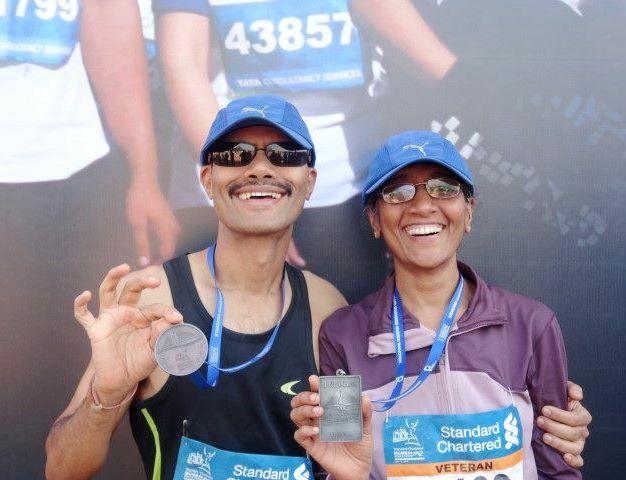 At the first formal running event they participated in – it was at the Borivali National Park in August 2011 – both husband and wife ended up on the podium. Slowly a new ecosystem grew. The occasional podium finishes they got encouraged the doctor-couple to run, while in NMR, they had a motivated group of people to train with who were also quite egalitarian in their perspective. To this Pravin added his characteristic twist – always the devoted student, he read up on running and researched the sport on the Internet. This was blended with his tendency to push himself. I always wanted to challenge myself. The human body has considerable reserves – these were among sentences that cropped up regularly in our conversation with him. 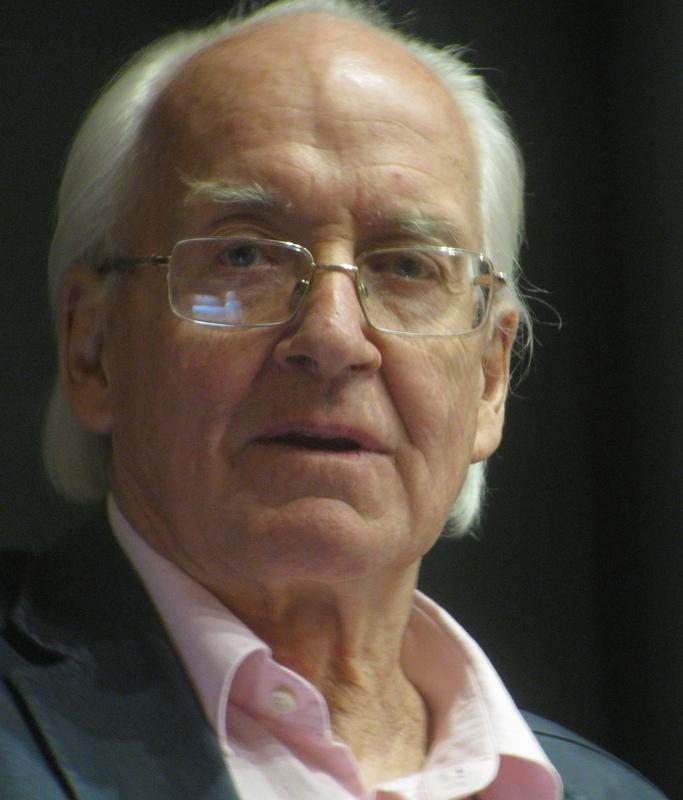 He credited that approach to his medical training. 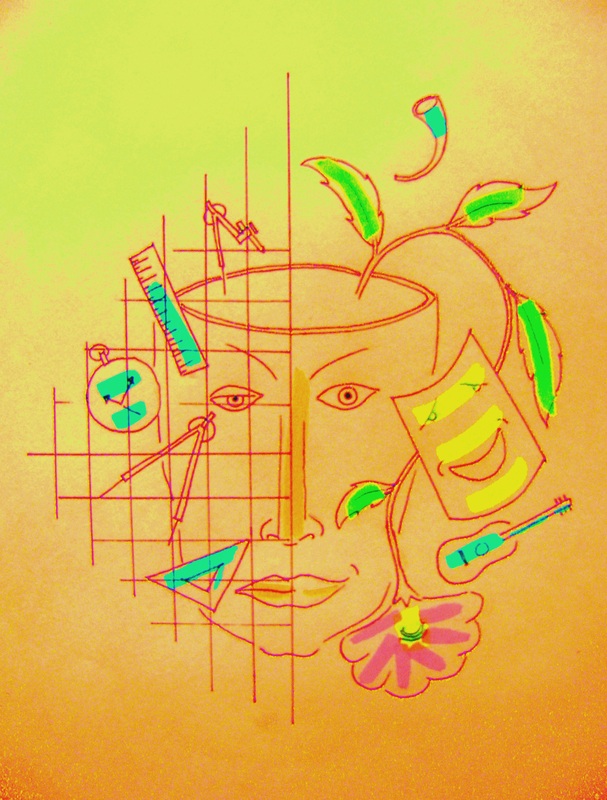 In the medical profession, one is always learning about what the body was designed to do, what the body has wrecked, how that happened, how the body repairs itself and what the body has in reserve. Pravin graduated from the early short runs to the half marathon and on to the full marathon. His transition was smooth. “ If you are a good swimmer, you don’t fight with water. You glide through it. You can do the same with running,’’ he said. All this was alongside busy days at the clinic. In 2012, the two doctors travelled to Thiruvananthapuram in Kerala so that Arati could do a short course in problems concerning adolescents, at the Thiruvananthapuram Medical College. Now she also works with Pravin at the clinic devoted to children’s health. “ We would as pediatricians love to influence the lives of the adolescents we work with by acting as role models directly or indirectly, by motivating them to inculcate healthy food habits and healthy lifestyle with physical activity playing some role in their lives,’’ Pravin said. In November 2016, the Gaikwads were part of a group of eight doctors who conducted sexual health workshops in Dahanu tribal schools. “ We hope to do many more workshops and empower our adolescents to take the right decisions for a healthy life and a better future,’’ Pravin said. Life with a swimmer brought Arati seriously to swimming. She was no stranger to water and swimming. In her childhood her father had packed off his children to the pool at Shivaji Park, Dadar, so that they were acquainted with the basics of swimming. But with no proper coaching at that time, it was at her swimming sessions post-marriage that she genuinely learnt. After Pravin started going out for runs, he used to tell her that she should experience it at least once. “ He knew I would be interested. Upon trying, I found running doable. On my first run, I didn’t stop anywhere,’’ she said. She was able to complete a 21 km-half marathon in two hours, forty five minutes. Although she had the distinct feeling that she would be able to run well, she took a back seat. First of course, was her nature, which was partial to being less systematic; it was more organic and less deliberate or driven. “ I am not very focused,’’ she said. Arati for instance loves her sleep; Pravin being endurance junkie can do with much less. Pravin spends on equipment, researches what bicycles to buy. She doesn’t. Second, as she put it, “ in a family, both people being equally dedicated to running can be a problem!’’ They have two sons. She confessed to being secretly happy with the occasional injuries Pravin picked up through running, for it kept the endurance junkie at home with family. At times her happiness showed. “ He would quip: you seem to be happy with my injury,’’ she said laughing. For most of her races, Arati trained alone. Her first formal half marathon was at SCMM, the result of an event registration gifted by Pravin. 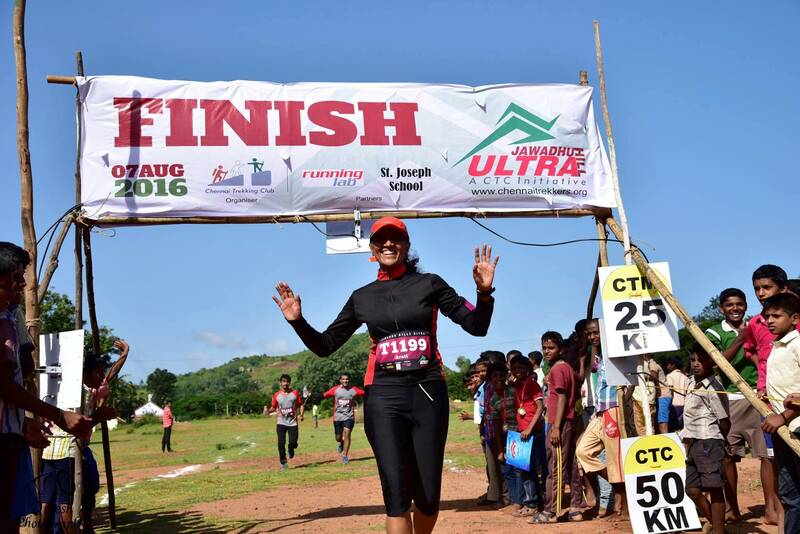 After three years spent running half marathons, Arati moved up to the full marathon. “ There is a world of difference between half and full marathon. I want to try running 42 km without formal training, without the tension of going through a systematic programme. I am a different personality, he is a different personality. I cannot be like Pravin,’’ she said. Yet notwithstanding this core disparity in their individual nature and personality, the Gaikwads participated together in several events. In 2013, Mumbai Road Runners (MRR) chose them as the running couple of the year with Pravin and Arati being additionally declared second runner up in individual awards for the male and female categories. It was his endurance cast through long association with water that provided the basic substratum for the runner in Pravin to stand on. His competence in swimming has grown to encompass both the confines of a pool and the openness of the sea. He has been a participant in sea swimming competitions with podium finishes at some. With running also added and cycling known, the triathlon beckoned. 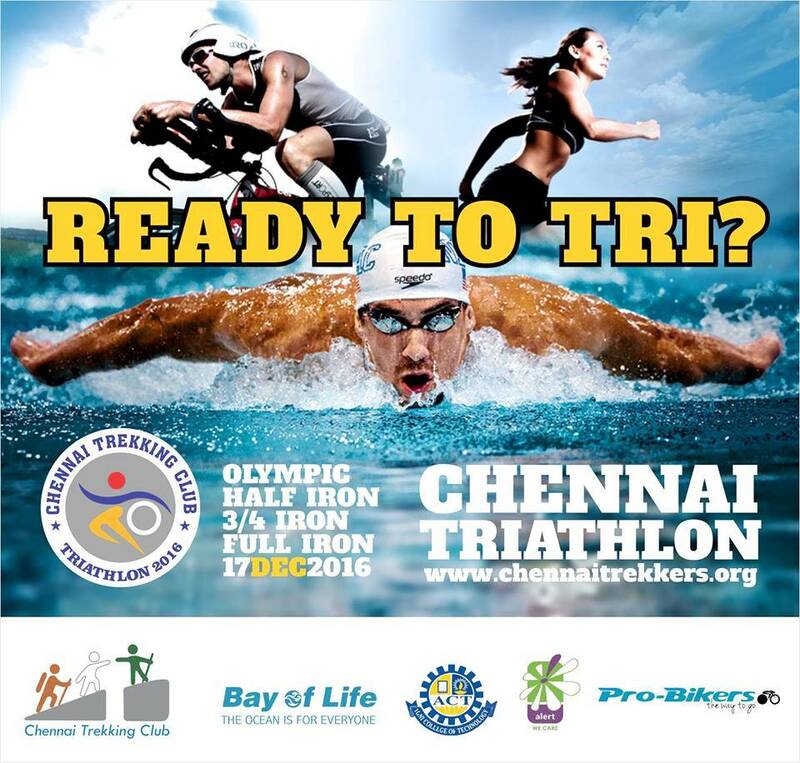 Both Pravin and Arati have participated in and completed triathlons in India. In April 2015, the couple participated in the Pune Triathlon with Arati winning in her category in the sprint distance and Pravin finishing second runner up in his category in the Olympic distance. In December that year, they also participated in the Maharashtra State Triathlon in Sindhudurg emerging winners in their respective categories. 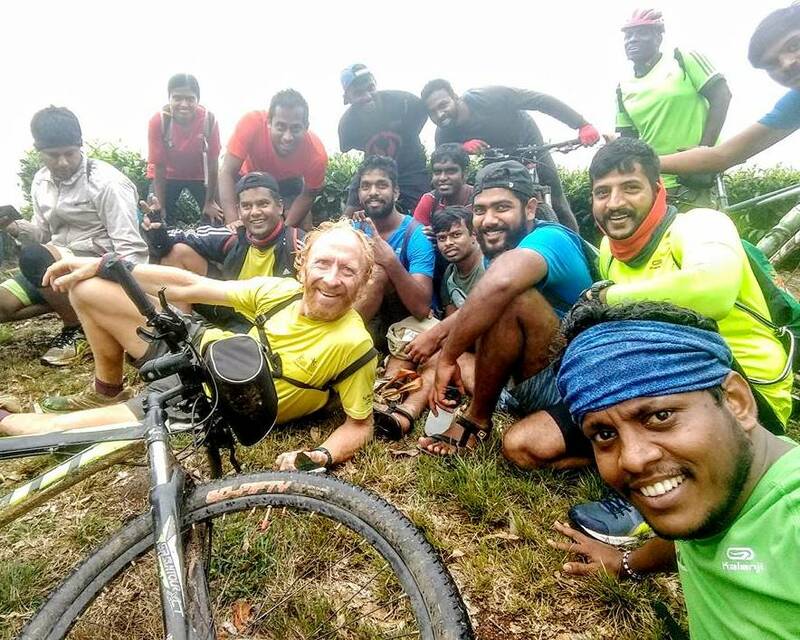 “ I can do the half Ironman, that shouldn’t be a problem,’’ Pravin reckons, “ a full Ironman will require devoted training; maybe in two to three years’ time.’’ Their passage through these disparate sports, all sharing the common thread of endurance hasn’t been without its moments of anxiety. In Nerul, not far from the town’s Ayyappa Temple, is the small bicycle shop run by Inderjit Singh Khamba. He worked for many years in the training and development line; then quit his job to begin something on his own. He loves technical stuff. The first business he ventured into was assembling computers. Currently he is fully into selling, building, maintaining and repairing bicycles. Inderjit knew that the bikes he built were only as good as they performed. So he started going for rides on them, acquiring thus a background in cycling. One of the people who dropped by at his shop was Pravin. As their mutual familiarity grew Inderjit asked if Pravin and Arati would be interested in participating in a 180 km-Veloraid, which Inderjit had taken part in twice before. It was a team event. Pravin hadn’t cycled such a long distance before. So they went out for a test ride and with the outcome looking promising, the Gaikwads said yes. According to Arati, they were a team of six cyclists. The Veloraid was from Yeoor Hills to Tansa Lake and back. During training sessions, they had been on a section of the route before. On the day of Veloraid however, it rained and there was mud on the road. Roughly six to seven kilometers before Tansa, on a downhill section of the route, Arati tried to avoid a pothole and went off the road. “ I was ahead and heard something like the sound of a tree cracking or crashing,’’ Pravin said. Inderjit was behind Arati; he saw the accident happening. According to him, Arati’s perch on her bicycle wasn’t perfect; the handle bar was too close to her body. This meant, the slightest jerk while steering the bike, translated into major variations at wheel level. “ Into the descent, there were a few S-shaped bends on the road. Two things happened. First, Arati gathered speed on the descent. Second, there was an arc-shaped portion on the road’s edge, where the tarmac had totally weathered off. The wheel of her bike entered this portion and didn’t climb back up. Instead, the pothole’s edge guided it off the road,’’ Inderjit said. Arati was hauled up from the hillside, some eight to nine feet below the road. “ I was in a daze. I didn’t know what was happening,’’ she said. While she escaped with minor injuries, her helmet was a statement of what could have been – it was split open down the middle. She had a cut just above the eye, a cut on the chin, bruised elbows and knees and overall body pain from having had to be pulled up. Post-Veloraid, it took her a long while to recover from both the strain to her torso as well as the overall shock, a side effect of which was weight loss. The Gaikwads’ return to cycling has since been careful. On his part, Inderjit, noticing the mismatched positioning of the handle bar on Arati’s cycle, has built Arati a new bicycle. “ I will resume running, cycling and swimming when my body feels ready for it,’’ she said. About 10 days after we met her, Arati was among those who successfully completed the half marathon at the 2017 SCMM. It wasn’t the best of timings but true to her nature, she appeared content and happy. Pravin’s diligent training continues. Those who train with him say that he is very disciplined in his approach. He is strict in training schedules and adherence to proper diet (if he is running at a location away from home, he often brings along food suited to the diet he is observing). While training, if he is supposed to meet a certain target on a particular day, he will make sure he does, Mani Iyer, who has trained and run with Pravin, said. As combination of doctor, keen runner, triathlete and someone who reads to know more, his friends consider him well informed on the subject of running and endurance sport. An approachable person, he is known to offer tips to others on how to improve their performance. At the same time, even during his training hours, he remains available to patients. He is capable of running and discussing a medical case on the phone at once, friends who know him well, said. 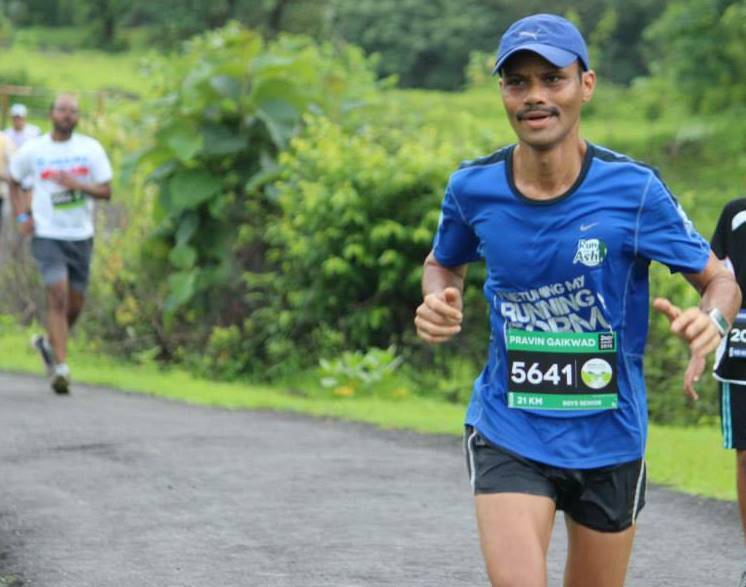 Pravin’s personal best in the full marathon so far, is 3:38, registered at the 2017 Standard Chartered Mumbai Marathon (SCMM). 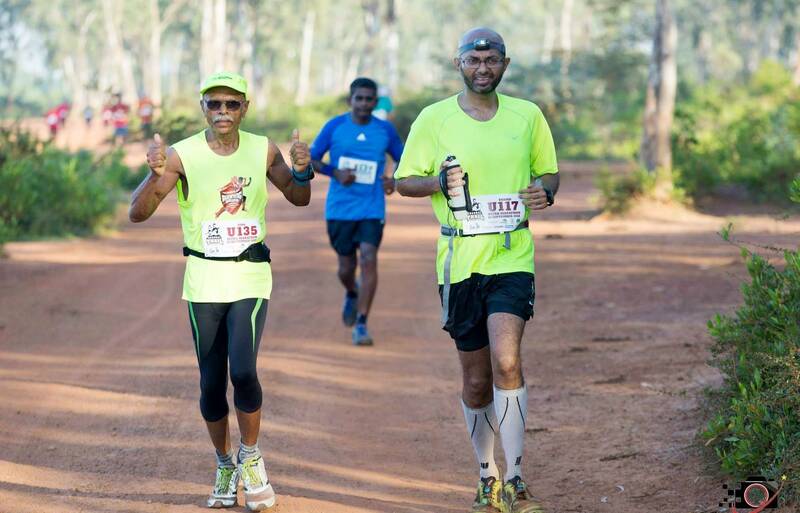 He has also done ultramarathons – he did the Javadhu Hills Ultra in Tamil Nadu in 2016 (Pravin was first runner up in his age category, while Arati who ran the shorter 25km-event was first runner up in her age group), the annual Mumbai Ultra and in 2012, a dawn to dusk run in Navi Mumbai organized by NMR. “ I don’t want to run many events. I would look at perhaps a full marathon, an ultra and a triathlon every year,’’ he said. 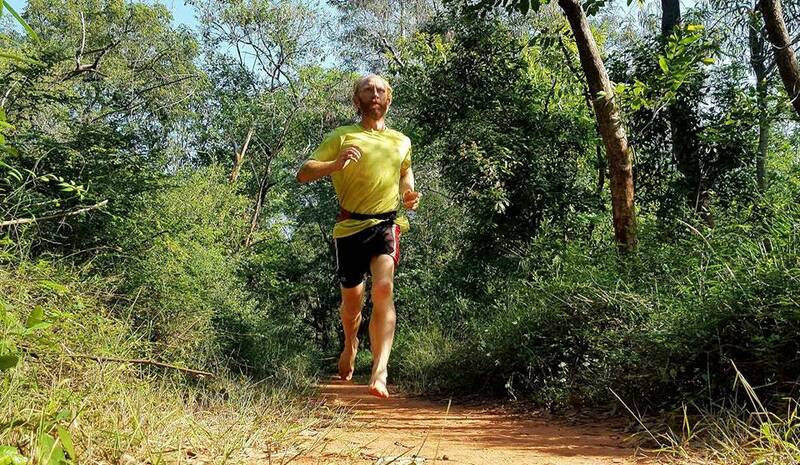 In terms of events overseas, he has his eyes on the Boston Marathon and The Comrades in South Africa. No matter what the event, he would like to prepare diligently for it. On that, he is clear.